Temple of Lore - View topic - which race/class/subclass are you mostly interested in? which race/class/subclass are you mostly interested in? Nothrog Barbarian or Deverenian Fighter for me. FreeK Paladin of the Golden Dragon. Spencer Latham gave me a sweet bike! 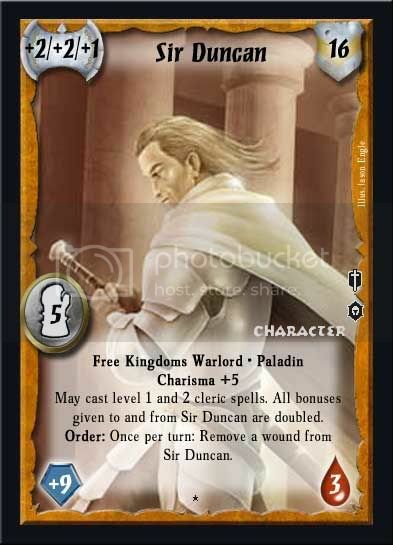 I find it greatly amusing that the Grand High Masters of the order, the Pal 15/Champ 5 give up having a Vorpal weapon that can't damage innocent people for... the ability to use prayer up to five times per day. Tokhuah : "do people on the ToL really lack the imagination to apply a principle to a broader perspective?" seige911: "It's unfortunate too. I wouldn't mind someone giving guys like this nut shock treatment." T3chno: "Nihil doesn't have friends, he just has enemies that hate him less." Nimbic Wizard (Enchanter) Spell Focus and their Race/Class ability cranks the DC up the crazyness. DM: You walk into a room full of orcs. What do you do? Me: Charm. Dominate. Suggestion. Command. Next room. DM: Uh...another room of orcs. Me: First group of orcs, go kill your friends. Location: Go ask the pope! I've been thinking that I might want to start with a nothrog rogue. Give him the Magical Bloodline feat at first level and choose the cantrips Detect Magic, Mage Hand and Ray of Frost. I would also select fighter as his favored class. The skills that he trains in as a rogue would include Use Magic Device. For his second level he would cross class and pick up one level of fighter. He would select the chained sword as his favored weapon. That can be done because the chained sword used two handed is a martial weapon, you only need the exotic weapon profoiciency feat in order to use it one handed. For his third and all subsequent levels he switches back to the rogue class. As his favored class is fighter, then his fighter level does not count when determining whether or not he takes an experience point penalty for having unbalanced class levels. The feats he would get at higher levels would include point blank shot, precise shot, exotic weapon proficiency chained sword. I would worry about what other feats to select farther on down the line depending on whether or not the character actually survived and what tactics seemed like they would work better.